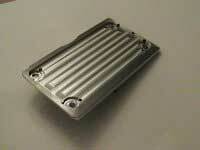 Precision Engineerings own custom CNC parts for your snowmobile. All of our parts are made in house to exacting standards. When you buy from Precision Engineering you are buying parts that are 100% made in the USA. Don't see a part listed or have a custom job contact us today for pricing. CNC machined billet aluminum torque plate, helps prevent case twisting and subsequent crank failure on Polaris twins.